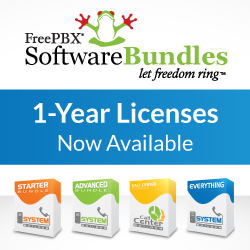 CALL PARKING, is an often overlooked feature of FreePBX. Call Parking allows you to Park a Call on an extension that can then be picked up by any phone on your system by simply dialing the extension where the call is parked. For businesses that have large distributed offices or workers that could be anywhere on their property this is a great solution for managing your calls. 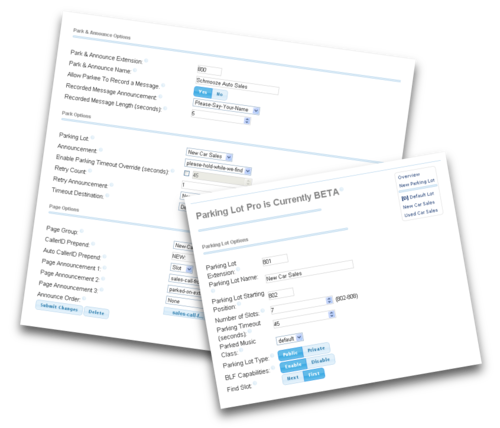 Utilizing FreePBX’s default Parking Module you have access to one parking lot, so when a call is parked (usually by either transferring the call to the Park Extension, or a custom “Park” button) you would then have to notify your users that a call is waiting by creating an additional page to all of your phones and overhead speakers. It’s this complexity that often keeps users from getting the most benefits of the Call Parking Feature. The limitation of one parking lot is also an issue for larger organizations or companies with multiple departments or locations sharing the same PBX. 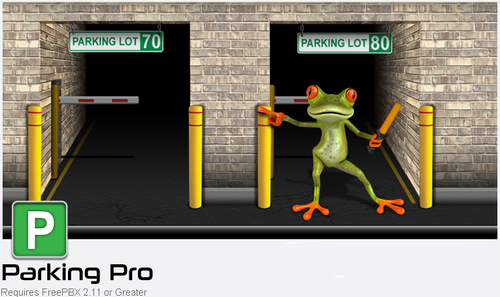 Parking Pro Adds the following enhancements to the Parking Features in FreePBX. Add Multiple Parking Lots– Each business unit, location, or department can now have their own parking lot. This is useful for companies running multiple locations off the same server, or companies that need multiple parking lots or have many internal departments. Private Parking Lots– You can restrict which extensions can pick up parked calls, allowing you some call security, and the ability to create shared parking lots for a “Manager-Assistant” scenario. Parking BLF Hints– Create BLF hints that can be mapped to phone buttons to indicate when a call is parked on a particular lot, and to easily park and pick up those calls as needed. Parking Park & Announce Feature– This feature automatically Announces Parked Calls to a Page Group, allowing the system to notify users of waiting calls automatically. The Park and Announce feature of Parking Pro allows you to set up and define & automatically announce when a call is parked by paging a group of phones. Parked calls can be picked up by anyone on a system. As an option this module allows the caller to leave a brief message to be played during the page announcement. This can be useful for announcing the callers name or other information requested from your caller. Parked Calls will then be announced to the a paging group allowing anyone to pick-up the call at the announced extension. Optionally allow Callers to Record a Message- if enabled you also control the message length, as well as the message played to the caller before the recording. Choose which Parking Lot the caller will be sent to- Useful for companies running multiple locations off the same server, or companies that have multiple Parking Lots or Departments. Prepend Parked Call Caller ID with Text, and/or Parking Slot Number. Assign up to three different Page Announcements/ Recordings to be played during the page announcement. Scenario 1: A busy car lot gets a sales call from a prospective customer. With all of the sales reps out on the lot, the receptionist transfers the call to the Park & Announce extension for the Sales Department. All of the Sales Reps phones, including the overhead paging system then receive the page “Sales Call” “Used Cars” “Parked On Extension” “71” and an available sales rep then answers the call, by dialing extension 71 from his phone. Scenario 3: To save on Hardware cost the same dealership is using the same PBX to run their new car dealership as their used car dealership across the street. Each location is a separate entity with it’s own sales staff. With the Park Pro module they have added a parking lot for each dealership and associated paging groups for each lot to the phones at their respective locations. They can now park calls for both companies on their own individual lots without having to share a single parking lot. NOTE: In order to enable Park Pro’s Announce Feature we have Bundled this module with a license of our Paging Pro Module, this adds additional extra features and value to your Parking Pro purchase.